The RSF-backed driver made a strong start to out-drag second row partner Antonio Giovinazzi and launch himself ahead of Charles Leclerc and into second at the over-crowded Rettifilo chicane. The bold move ended in contact which led to the Monegasque's premature retirement at the exit - and the first of three safety cars. 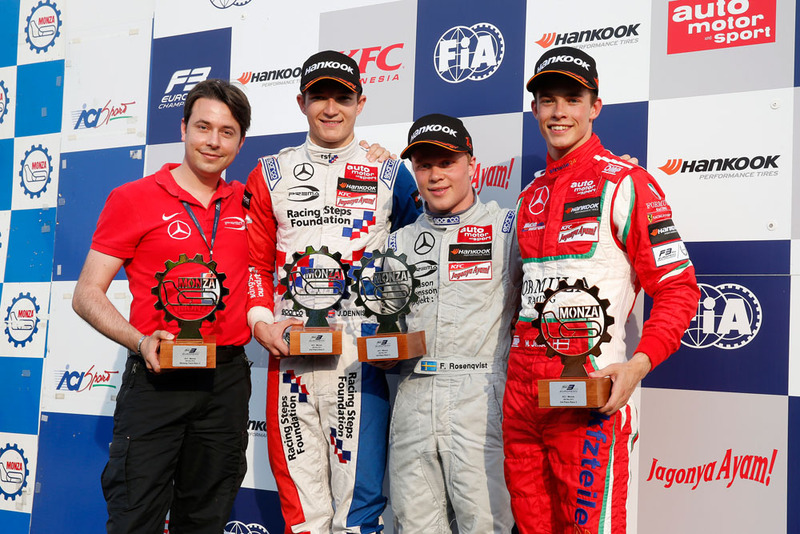 When the action resumed race leader Felix Rosenqvist took up where he left off with Prema team-mate Dennis in tow, followed by the Mucke duo of Mikkel Jensen and Santino Ferrucci. But no sooner was the race back underway than Carlin's Antonio Giovinazzi and Prema's Lance Stroll clashed at Curva Grande while battling for fifth. The contact launched the Canadian into an horrific barrel roll which brought the safety car back out while the stricken driver was attended to at the trackside and the aftermath was cleared. Three laps of racing then followed with Dennis pressurising Rosenqvist every inch of the way only for separate incidents involving Dorian Boccolacci and Maximilian Gunther, and Michele Beretta to trigger a third safety car period. A further three laps of racing followed the resumption before a final incident - involving Matt Rao and Alessio Lorandi - brought out the red flags as race officials called a halt to the mayhem. Rosenqvist took the win, with Dennis second and Jensen third. It was Dennis's second podium of the weekend and sixth of the season so far and Prema's first 1-2 of the year. Update: The race - which was subsequently wound back a lap - attracted only half points.